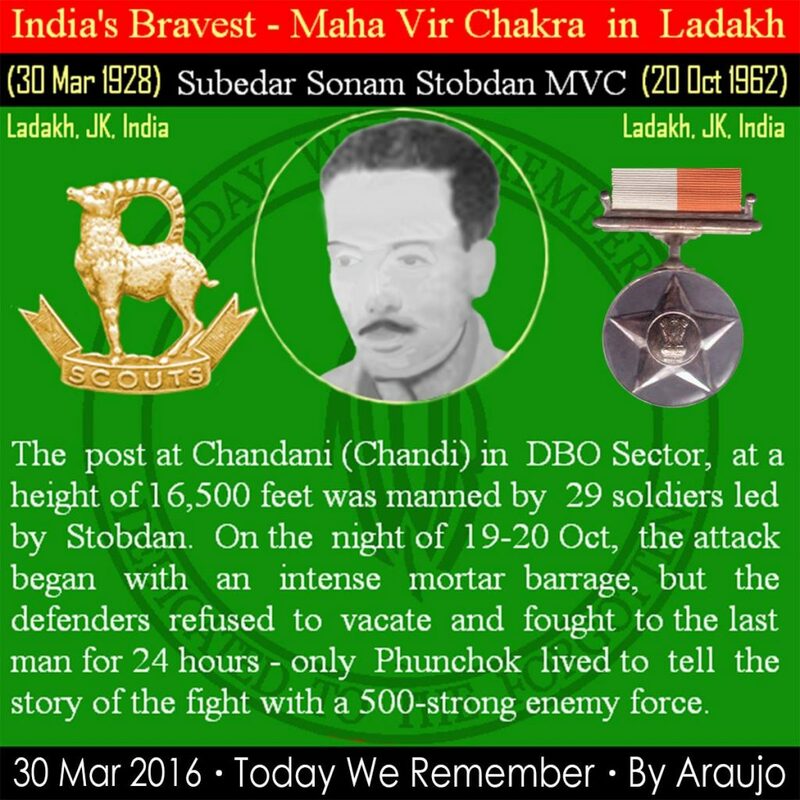 Subedar Stobdan Sonam was born on 30th March 1928 to Sh. Tashi Wangail and Chhering Palzom in Ladakh, Jammu & Kashmir. He served in 14 J&K Militia/ Ladakh Scouts which was deployed at Chandani post of J&K during 1962. 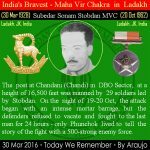 During the hostility with china in 1962 Subedar Sonam Stobdan was commanding the Chandini post with 29 men. On the night of 19 October 1962, 500 Chinese soldiers attacked a post using automatic weapons and mortars at Chandani in Ladakh. Subedar Stobdan Sonam displayed gallant act and through his inspiring leadership motivated his team thoroughly. He and his team fought back the Chinese and inflicted heavy casualties to the enemy. Though they were highly outnumbered by their enemy, it did not deter them in putting up a brave fight and causing substantial damage to the enemy. Inspite of less number of soldiers at the post and vintage weapons compared to Chinese army’s sophisticated arms and ammunition they fought fiercely but felled to the enemy bullets and laid down their life while fighting the enemy. Subedar Stobdan showed courage and devotion to duty of a very high order. He was posthumously awarded Maha Vir Chakra. 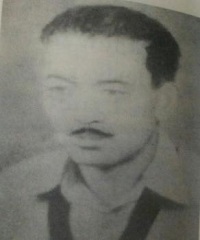 On the night of 19/20 October 1962, when the Chinese in overwhelming numbers attacked a post at Chandani in Ladakh using automatic weapons and mortars, Subedar Sonam Stobdan, who was commander of the post, put up a gallant fight and displayed inspiring leadership. He and his men fought to the last and inflicted heavy casualties on the enemy. Subedar Stobdan showed courage and devotion to duty of a high order. I salute my grandfather for his bravery.I am proud to be his grand daughter.